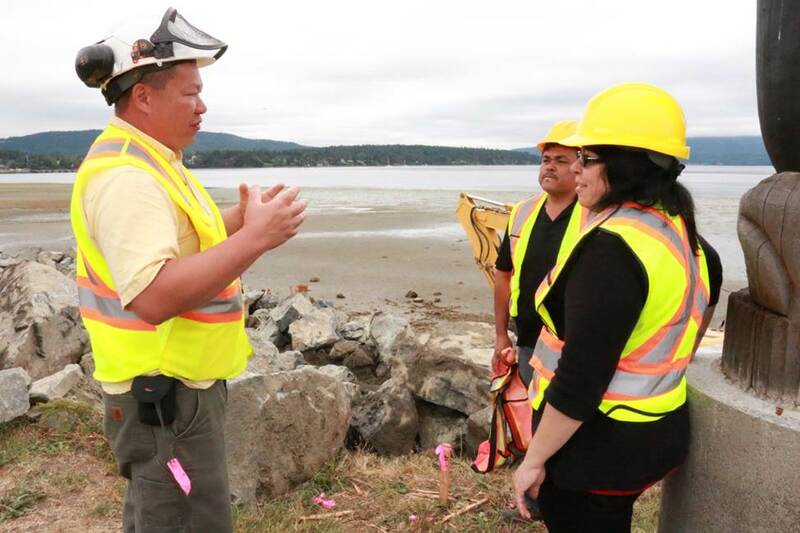 Recently, along the shores of the Tseycum First Nation on Vancouver Island, we worked in partnership with the Tseycum people to prevent a portion of the Patricia Bay beach from eroding and washing out West Saanich Road. But it turned out that road restoration was only a piece of what we accomplished here. 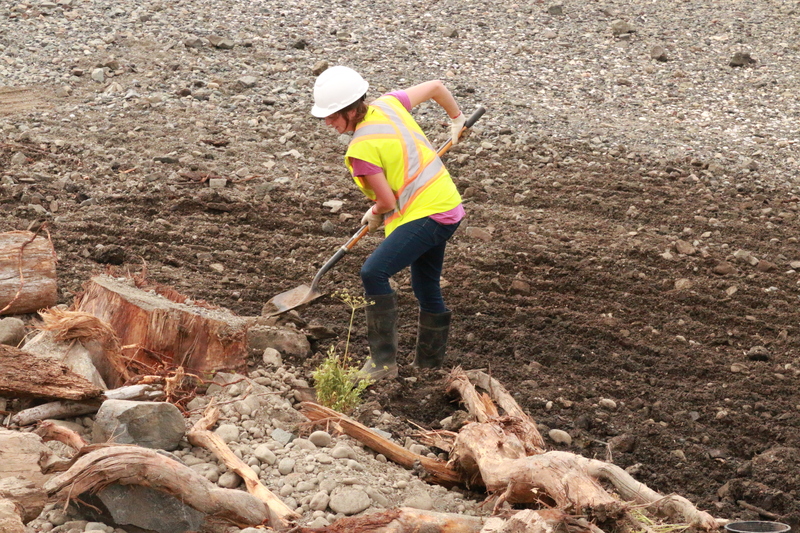 We also expanded wildlife and salmon habitat at Wsikem Creek, helped protect and monitor precious artifacts and ancestral remains as well as create lasting relationships along the way. Wait a minute. Did we just say artifacts and ancestral remains? Yep. We did. Many people who walk, bike or drive through this portion of West Saanich Road don’t realize that the road was originally laid over top of an ancient burial ground, and that some of the remains here date back about two thousand years! To help protect Tseycum’s ancestors, we worked with Tseycum’s expert archaeological monitor and carefully carried out our stabilization work, making sure not to disturb the remains but instead further protect them from future storm surges (which have occurred here in the past, exposing remains). To protect the road, and the precious artifacts, we “keyed” (or embedded) rip rap into the embankment of West Saanich Road, as well as incorporated green shores components, such as integrating large woody debris (recycled from our nearby Malahat Safety Improvement Project) and salvaging and sourcing native plants to help stabilize and “green-up” the area. We now feel confident that this special area will remain intact for many decades to come. Throughout the project, we had the opportunity to collaborate with many members of the Tseycum community. During one of our discussions we discovered that historically, salmon and trout were present in the Wsikem Creek but, because of typical impacts from urban and other development, those populations are extirpated/locally extinct. With this in mind, we excavated the creek channel to a depth suitable for salmon spawning, (and removing over 1000 dump truck loads of sediments over a 500 metre length to do so! ); placed spawning gravel in stream, along with large woody debris and new plantings to complete the work. During our time in the creek, one of our excavator operators noticed some sharpened posts. We speculated that they may have been used as part of a fish fence for fish/salmon harvesting. After showing the posts to Tseycum First Nation Archaeology Monitor Vern Jacks Jr., local archaeologists were called in and they immediately confirmed they were indeed wooden fish fence posts/stakes! This is physical proof of historical First Nation fish harvesting in the creek, and echoes the oral history from Chief Jacks. 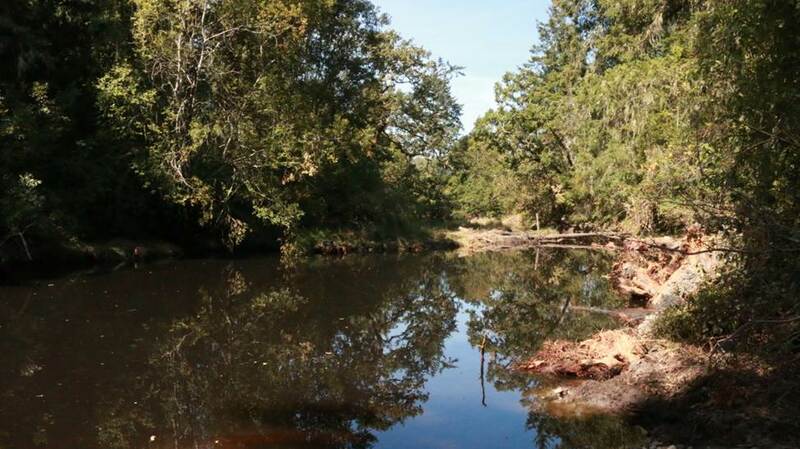 It also reinforces our habitat restoration efforts. In the fall, we plan to work with the Goldstream Volunteer Salmonid Enhancement Association to place Chum and Coho fry into the creek and try to help re-establish a self-sustaining population. 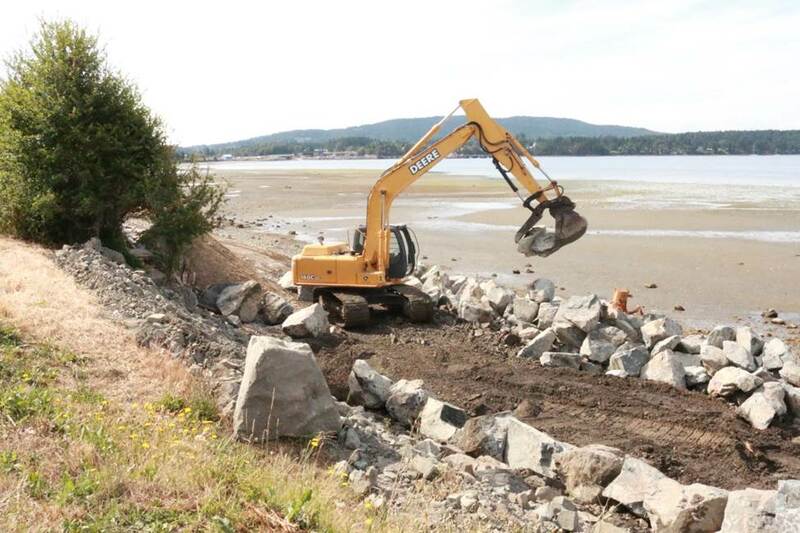 We also installed beach gravel along the foreshore in Patricia Bay to provide habitat for sand lance and surf smelt. These smaller, forage fish are considered keystone species because they provide important food and other benefits to many other species in the food web. 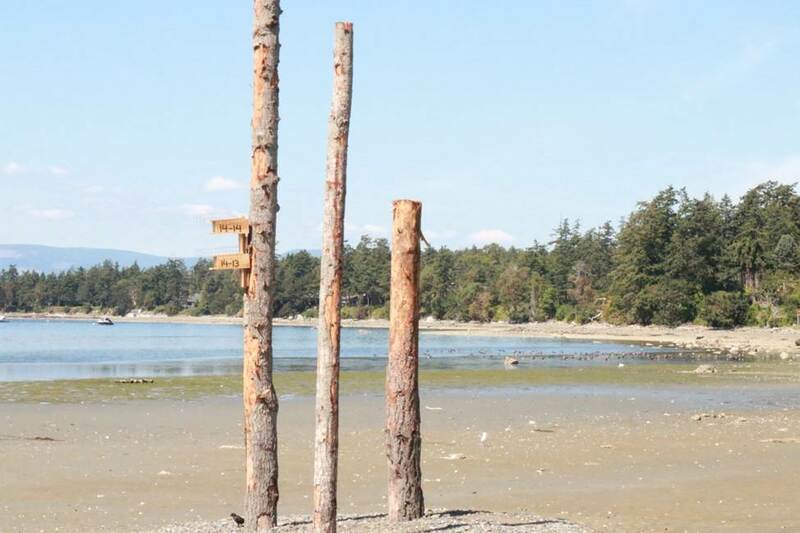 Artificial snags along the beach will provide homes for birds like the Purple Martin, which were close to extinction in the 1980s, but now, thanks to efforts such as this, are increasing in number. The snags are anchored at their base by large boulders, also dug down into the beach for extra stability. Of course, we could not have done all of this work alone. Like every project we undertake, a large part of what we do involves working with local communities and building relationships with many, many people. The Tseycum First Nation was integral to the project’s success, providing guidance and support throughout the entire project. 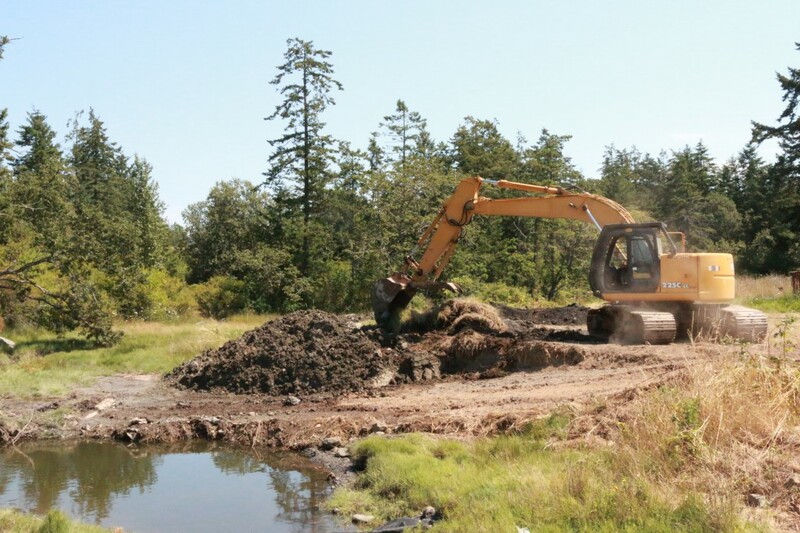 Tseycum First Nation is excited to act as a steward of these improvements and we hope that the bonds we created during our work together will foster continued communication and understanding. Other helping hands included: The Peninsula Stream Society, Fisheries and Oceans Canada, Pacific Salmon Foundation and the Sea Watch Society. We talked about history and tradition, but mostly about the present and the future, agreeing that is where the real journey begins. “It’s a good feeling working together… it makes a lot of difference because it’s something that we’re doing together. We’re going to be here another thousand years, you know. So work with us, work with our people. I think with what is going on here now; we are going to be successful. Sometimes, when you travel down a road, the journey you take has a long-lasting effect on both you and the people you meet along the way. That is how we feel about this project. It’s a journey we are happy to have taken. 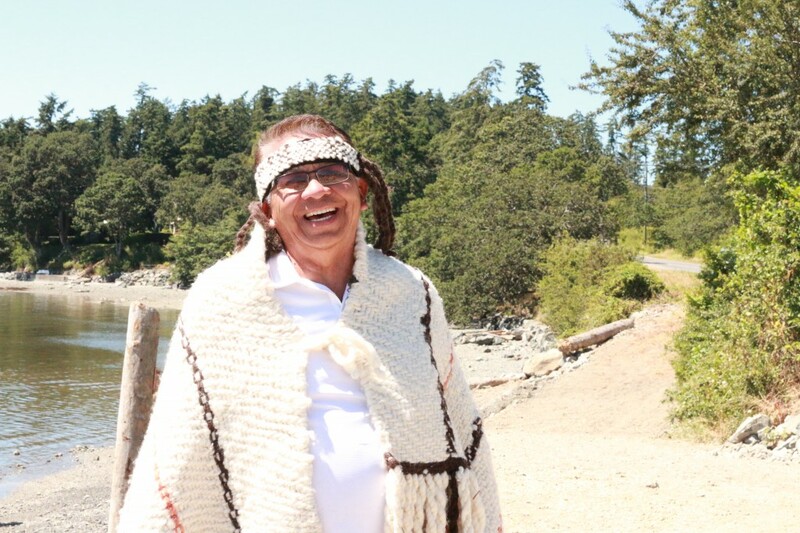 Fawn Jack of Tseycum First Nation, worked on the project from start to finish. 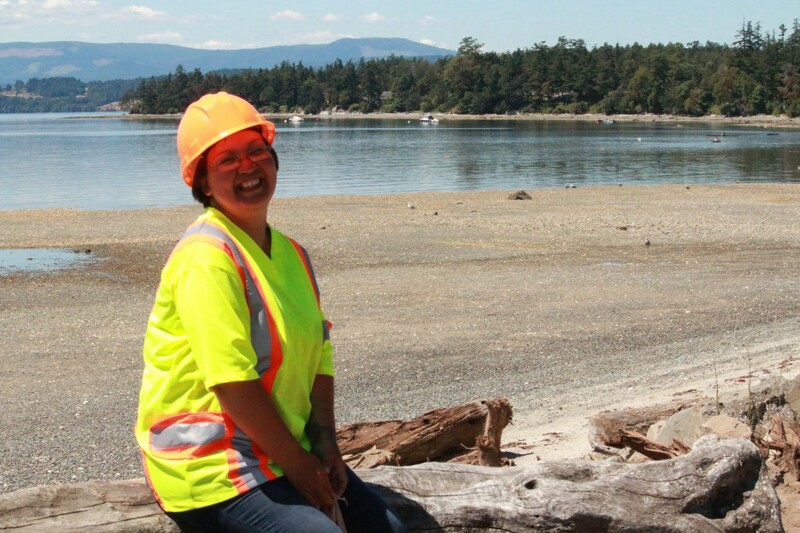 She received on the job training in traffic control, becoming a certified traffic controller as well as helping with replanting native vegetation. Very interesting we wonder what was going on, we often sit on that beach.As a member of the Goldstream Salmon Enhancement Society found this article very informative and interesting. Will have a different out look next time we sit on the beach. Thank you. Glad to hear that you liked this story Art. Enjoy your time on the beach! First Nations people are the only people who now how to use and preserve and treat the land that is why the great creator put in into their hands – if only people will listen. I believe in you – keep up the good work! Thanks for the kind words Wanda!